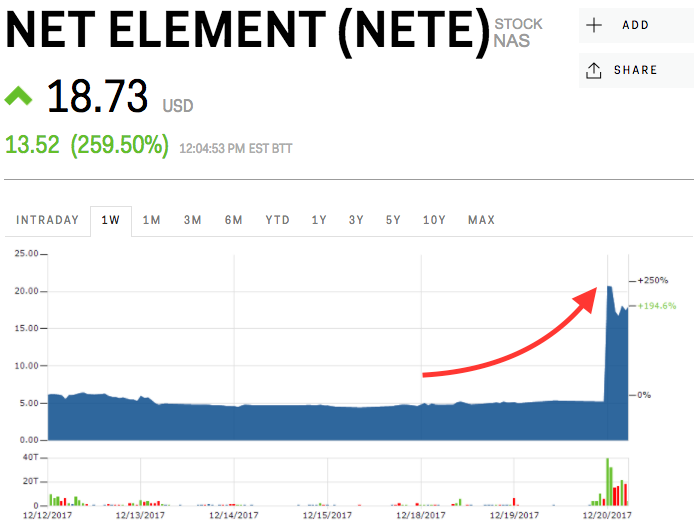 Net Element's stock rose as much as 300% on Tuesday following news it was launching a business unit focused on blockchain technology. The company said it was partnering with blockchain and crypto expert Bunker Capital. Net Element is the latest company to see its market cap rise following a pivot to cryptocurrencies or blockchain. Shares of Net Element soared more than 300% on Wednesday after announcing the launch of a new blockchain-focused business unit. They have since pulled back and are up 254% at $18.60 apiece. The company said its new business unit will become a "decentralized crypto-based ecosystem" that will help directly connect merchants and consumers using blockchain technology. The unit will also focus on identifying and investing in innovative payment-processing services through the use of blockchain technology and its own development teams. Net Element is partnering with Bunker Capital, a firm that preps, promotes and markets initial coin offerings and offers blockchain and cryptocurrency expertise. Net Element's move into blockchain comes on the heels of a number of companies announcing a pivot to cryptocurrencies or blockchain technology. Most recently, Future Fintech Group announced a pivot from selling juice to building financial technology for the agricultural products commodities market. Its shares rose as much as 221% on the news. According to CoinMarketCap, the market capitalization of the entire cryptocurrency universe has reached over $600 billion in December. It was at just $17 billion in January. Subscribe to our Crypto Insider newsletter for the best of blockchain every day.